Chicken Fat: Let's Go To Marietta!!! Several weeks ago I had a blog postings that talked about The Big Chicken and how it was a good landmark when giving directions. Someplace, in the talk I said something to the effect that all roads leads from Marietta, or maybe I said all roads lead from the Big Chicken. Maybe all roads also lead TO Marietta. Remember cowboy star Lash LaRue? His real name was Al LaRue and a writer/producer christened Al Lash LaRue. Lash looked like Humphrey Bogart in a way, and always wore black. Sometimes he used a 15 ft bullwhip and other times he used an 18 ft bullwhip. He could yank his whip off his side and pop it out and snap a gun out of the buy guy’s hand just like that (I’m snapping my fingers)!. When he needed to, which was just about in every movie, he could throw that whip out and the end of it would wrap around a rafter or something and he would swing from point A to point B. Lash was a flash. His sidekick was a bearded guy named Fuzzy Saint John. Fuzzy’s purpose was about the same as Gabby Hayes’ purpose was in a movie – to give comic relief. 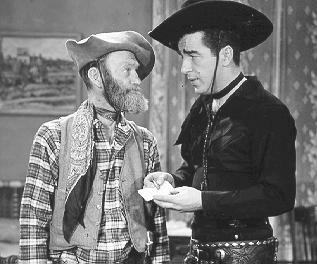 Speaking of cowboy hero’s comic relief’s, the only other one I can remember off hand is Smiley “Frog Millhouse” Burnette, who came to Marietta in the late 40s or early 50s. In the late 50s Lash LaRue came to Marietta. He had a drinking problem, so the word from the police department was. Lash liked the area so much, he decided to look for a job in the area. He stayed someplace in Marietta while he looked for a job. He finally got one at The Furniture Barn south of Atlanta. He was a salesman and did the TV commercials with his whip. 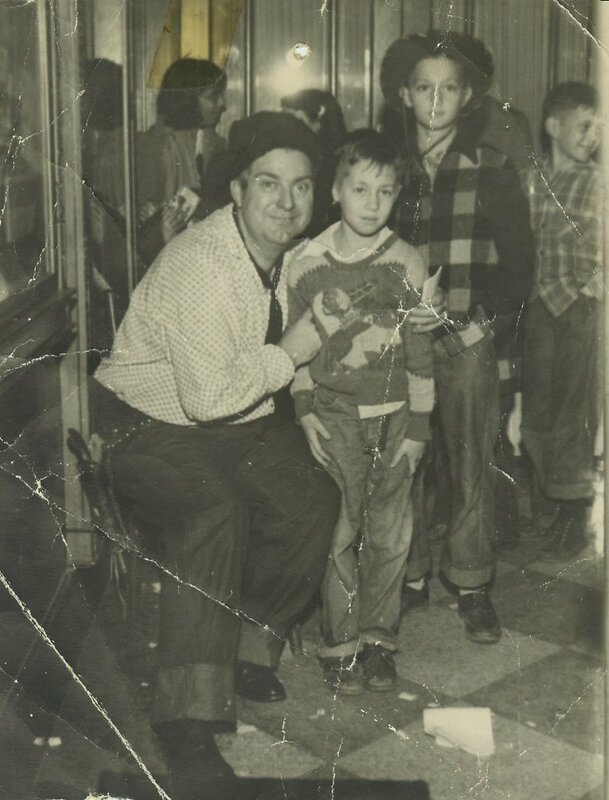 Shortly after Lash LaRue came Fuzzy Saint John also arrived in Marietta and the police officials were called upon. I would probably tell you the details if I remembered them, if I was told at all. You might say the details about Fuzzy is fuzzy. Lash moved on after a year or so. I don’t know how long Fuzzy hung around. I doubt if “Frog Millhouse” even spent the night. “Frog” and his comic relief partner – me. What a cute picture! I remember Smiley now that you wrote about him. Something about his features always reminded me of my father. I do look nervous don't I? It looks like I didn't know what to do with my hands. I guess I should have had at least one of them around his neck or picking his pocket. I well remember Lash LaRue. When I was in high school, I was a movie usher at The Campus. On Saturdau afternoons, I got to be the manager at the Roxy. Fifteen cents to get in. We showed serials and only the best, like Lash and Hopalong. Those were the days.